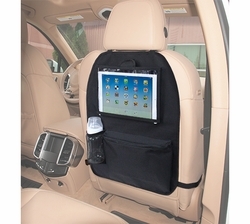 Easily attaches to the back of any seat. Pocket allows touch screen access. Store electronic device in zippered privacy pouch when not in use. Holds and protects your tablet. Electronic devices and accessories not included.